stevereads: Screeds and Hayseeds in the Penny Press! Screeds and Hayseeds in the Penny Press! 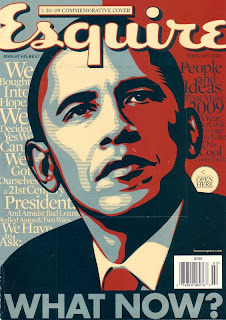 The February issue of Esquire has that by now iconic Obama image on its cover, and more enjoyably, it has another crackerjack piece by Scott Raab, this one titled "Someday We'll All Look Back on This and Laugh," about the hyperkinetic financial analyst Jim Cramer. The best thing about Raab's magazine pieces how hyperkinetic they are - he's one of only a handful of prolific periodical writers who remembers he's telling stories ... stories that have, or are supposed to have, a dramatic arc and impetus all their own, independent of their respective subjects. Way, way too many magazine pieces - even good ones, even ones I've praised here over the years - tend to overlook this first duty of any narrative, but Raab always remembers. This particular piece, being about a guy who predicts market trends so he can advise people in how to invest their money, has, therefore, absolutely nothing to recommend it to my attention - nothing except the most important thing of all: a good writer can make anything interesting. 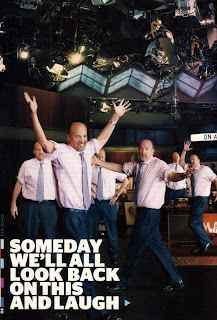 Raab is given some jealously-guarded time with Cramer (our writer is, as always, at his withering best when writing about the various PR flunkies doing the guarding), and Raab does a scrupulous job of profiling the man, but even so, the article left me with one impression clearer than all the others: Jim Cramer is insane. Not business bro-speak 'insane' (meaning 'intensely competitive' or 'wildly energetic'), but actually, clinically insane. I've never understood the allure of gambling, so financial investing has always been a walled-off mystery to me ... but even so, I finished the piece wondering how anybody could be dumb enough to take Cramer's advice on anything. If Raab's portrait is accurate, the guy free-associates self-aggrandizing thought-tidbits all day long, and what's worse: he never stops to think, about anything, ever. Who'd want to talk with such a person, let alone seek investment advice from him? So I buy and read the Galbraith book and almost wish I hadn't. It's all in there — every freaking thing that's going on right in front of my eyes, from the death plunge of overleveraged brokerage juggernauts to the assurances by the leaders of government and business that we've turned the corner and aren't really speeding our way to the poorhouse. The final paragraph — first published in 1955 — about how ignorance, self-interest, and complacency may someday, as in those years of fiscal carnage, enable a new group of free-market purists "who know that things are going quite wrong to say that things are fundamentally sound," spooks me bad enough that I start to stockpile daily ATM withdrawals from our credit-union savings account just in case. The main lounge of the Iowa Memorial Union is packed so full that when the Mad Money crew tries to bring in some of the overflow crowd — dozens of sad sacks in a nearby room watching a TV monitor — the IMU manager orders them back out again. And even as the city-britches CNBCers protest — heaven forbid an empty span of bleachers finds its way into a TV shot — the overflows dutifully shuffle off, back to their exile, still smiling. And suddenly a Star Trek-style wormhole opened up, and I found myself once again in that old, familiar position: agreeing to disagree with Scott Raab. Because of course he wasn't the only person living and working in Iowa City for seven years way back when, and some of us found it anything but 'soulless boredom.' How many times did I sit in that same IMU lounge, across a table from some earnest, well-muscled undergrad, urging him to read Herodotus or Tanizaki or Frank Conroy (and perhaps going to the bookstore next door and buying him copies)? And sadness, too, isn't boredom: I was sitting writing in a nearly-empty IMU lounge one morning idly half-listening to the big TV when Challenger was lost - the few of us sitting there just looked at each other, not knowing what to do or say. But that's just nit-picking! Raab's piece is fantastic - you should go to Esquire.com and read it in all its feisty, judging glory. John Singer Sargent, the Later Portraits! Second Chances in the Penny Press! Righteous Hitchens in the Penny Press! The Independence of Miss Mary Bennet! The Bantam Classic Sherlock Holmes! Guilt by Association in the Penny Press!